I had this romantic notion in my mind that I would move to San Francisco with just three boxes (one for cookbooks, one for kitchenware, and one for clothes), but that is clearly becoming an idle fantasy. Because every time I move, I'm appalled by the amount of junk that I seem to have collected over the years. Clearing out my closet, for instance, took an entire freaking day! I always thought I was good about throwing out stuff I didn't need, but apparently not — I had clothes that stretched back all the way to my freshman year of high school (specifically, a white French Connection skirt with embroidered flowers that I also wore to my college graduation brunch and could never in a million years fit into today), as well as collections from entire phases and fashion cycles in college. Remember when everybody wore flimsy, brightly colored cardigans and oxford shoes? Or American Apparel clothing non-ironically? Nope, just me? Okay. Going through the clothes and figuring out which ones to sell, donate, and keep was a challenge on its own. I gave myself some rough rules — one box only, and I would live life like Caroline, the minimalist fashion blogger from Un-Fancy who advocates maintaining only a 35-piece wardrobe capsule (though to be fair, she lives in Austin, TX and advises folks to only have 2 jackets on hand; which, SIDE-EYE, girlfriend has clearly never lived in the Pacific Northwest). That meant letting go of 90% of my wardrobe, including selling the size 26 (!!! ), barely worn Levis that I hoped to fit into again one day and the many beautiful Anthropologie dresses that at this point even Buffalo Exchange sniffed their nose at, because, let's face it, as pretty as they are, the 1950s housewife look just ain't big like it was in 2009. Or again, maybe that was just me. 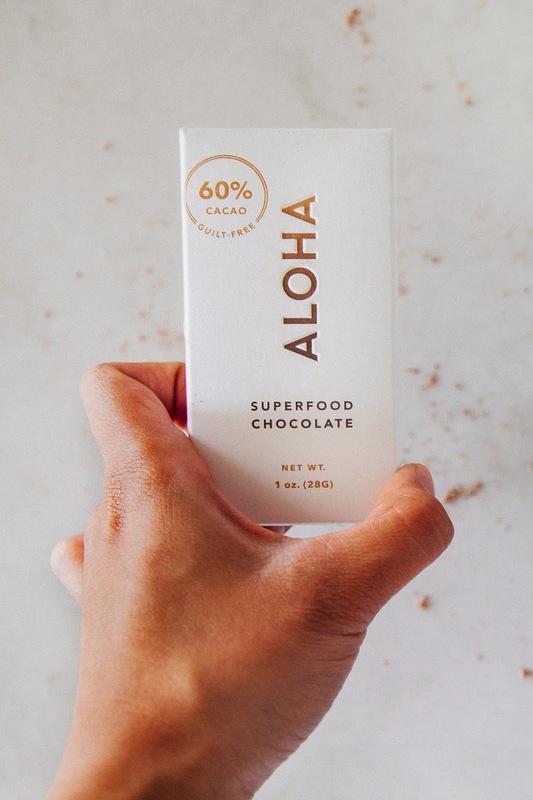 I know what you're thinking — superfood chocolate? What is she on about? 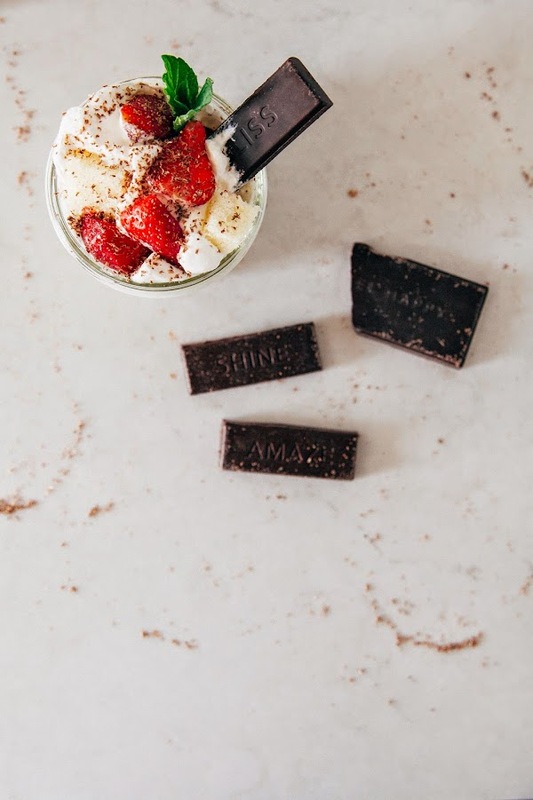 Hear me out — for these parfaits, I used Aloha Superfood Chocolate, which is vegan, refined-sugar free, and packed full of natural ingredients and sweeteners like cacao nibs, raw coconut flakes, and raw cashews. They also throw in their Daily Good Greens Chocolate Blend for even more nutrition, packing in peas, spinach, wheatgrass juice, berries, and even white button mushrooms. This is a little bit embarrassing, but Erlend and I had such a short notice/timeframe for moving that we actually would skip meals and eat some of the desserts I had lying around instead to save time. We're the worst, I know, I know, especially since I made a big stink about how I was eating well in my last somewhat panicky blog post. But I'm actually 100% convinced that the superfood chocolate is what kept me going as I went through boxes and boxes of my clothes. So at least there's that? But, hey, it's the homestretch, guys. I'm almost there. Wish me luck. 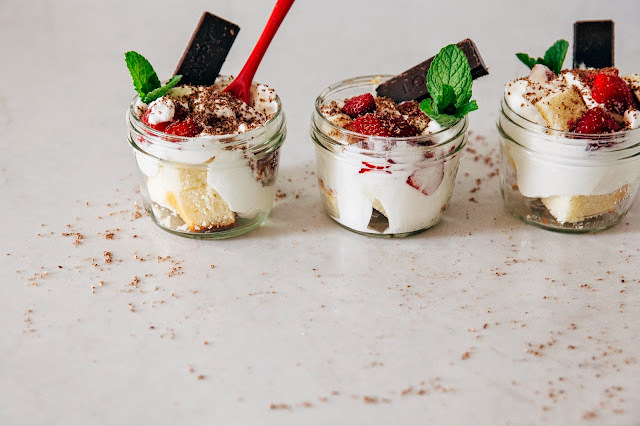 Parfaits are an awesome dessert because of their versatility — if you don't like coconut, feel free to swap out the cake and whipped cream with a flavor of your own choice! I like this particular cake recipe, however, since it makes just one small cake. It's hard to find cake recipes that scale down easily. This recipe uses coconut cream, which is distinctive from coconut milk. The Kitchn has a great article on the difference between the two. Coconut cream is usually available in the Mexican or Asian section of any grocery store. If you can't find coconut cream, you can also use the coconut cream that usually comes with coconut milk. If a can of coconut milk has been sitting for a while and isn't shaken properly before opening, the cream usually sits on top of the coconut water, which you can scoop out and whip up to use in this recipe. Center a rack in the oven and preheat to 350 (F). Prepare a 6 x 3-inch round cake pan by spraying generously with cooking spray and lining the bottom with a parchment paper circle. Spray the parchment paper with cooking spray as well. Set aside. In a medium bowl, whisk together 1 cup cake flour, 1/2 cup almond meal, 1 tablespoon desiccated coconut, 1 1/2 teaspoons baking powder, and 1/2 teaspoon kosher salt until well combined. Set aside. In the bowl of a freestanding electric mixer fitted with a paddle attachment, combine 1/2 cup unsalted butter and 3/4 cup granulated sugar. Beat on medium-high speed until light, fluffy and doubled in volume, at least 5 minutes. Once the mixture is light and fluffy, reduce the mixer speed to its lowest setting. Add 1 large egg and 1 teaspoon pure vanilla extract continue beating until fully incorporated. With the mixer speed still on its lowest setting, add the dry ingredients (from the 1st step) in 3 parts, alternating with 1/2 cup coconut milk in 2 parts, starting and ending with the dry ingredients. Continue mixing until all the ingredients are just combined. Bake in the preheated oven for 25 to 30 minutes, or until the cake is golden and a skewer inserted into the center of the cake comes out clean. The top of the cake should bounce back when gently poked. 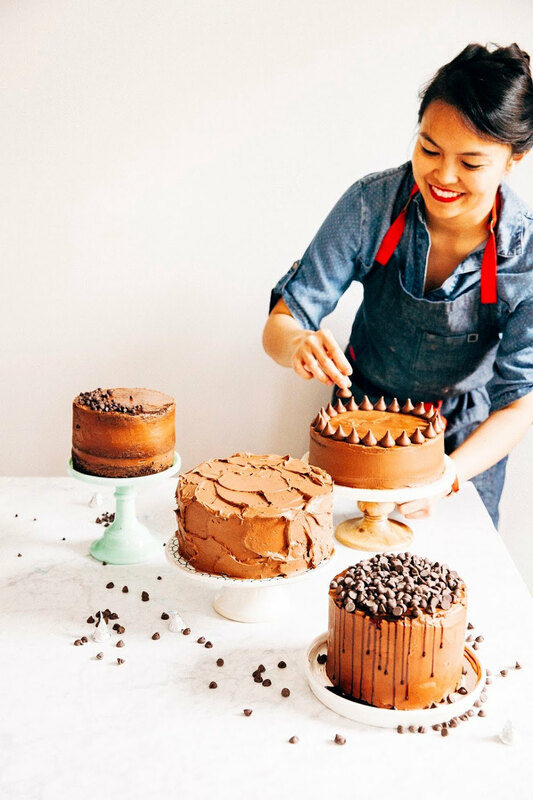 Transfer to a wire rack to cool completely before using a serrated knife to slice the cake into 2-inch cubes for the parfaits. First, make the coconut whipped cream. 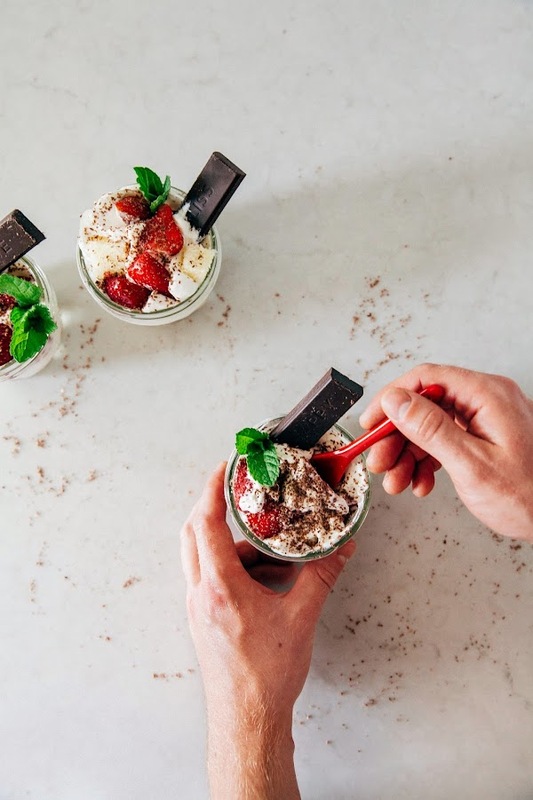 In the bowl of a freestanding electric mixer fitted with a whisk attachment, combine 2 cups cold heavy cream, 1/4 cup coconut cream, and 1 teaspoon pure vanilla extract. Whisk on medium-high speed until the mixture starts to thicken; add in 2/3 cup confectioners' sugar and whip until the peaks just hold their shape — be careful not to overmix or you'll end up with butter! 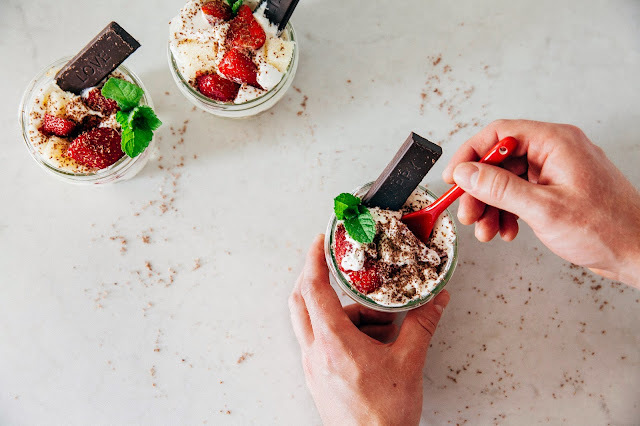 Divide the coconut almond snack cake cubes, coconut whipped cream, and 1 cup fresh strawberry halves evenly between 6 ramekins. Use a cheese grater or microplane zester to shave 1 ounce Aloha Superfood Chocolate over the ramekins. Serve immediately. Ditto what Kathryn said! They look so cute. That chocolate sounds awesome as well. I love mini anything, and these are GOLDEN. I feel you about the move - when Alex and I moved to Boston, we drove straight from St Louis in our little sedan. I was positive we could fit everything we had + an 8th german shepherd into our car and just move to Boston. Of course, we quickly figured out that the tetris game wouldn't work because there was actually not enough space to fit all of our boxes. So we chucked a bunch of random stuff (I feel ya about keeping old clothes. There are some things you just can't let go of, even if I should..) and it finally fit... Anyway, these look lovely. Good luck with the rest of the move. Hope to see you SF this summer! Beautiful!! Like seriously these sound so perfect. And I am just about to do a closet clean out too before third year starts and I'm going to try and be like Caroline too haha so we're totally on the same vibes!! Oh god, you should have seen the way we packed our car. We didn't even use any boxes because we figured out that we could shove more stuff in if we literally stuffed things under seats and between cracks. We were loading and unloading through the windows, because opening the doors would have caused an avalanche of stuff to fall out. Moving is the worst. Yay! I have such respect for her wardrobe capsule idea; I think I'm nearly there, though I'm probably gonna have more coats/jackets than what she recommends. I think it is the Spring time clean out but I have an itch to get rid of everything. I feel like I do a pretty good job keeping up to...a new comes in and an old comes out but lately I see stuff EVERYWHERE! Omg that's so awesome! Yeah I feel you with the whole jackets/coats thing... Indiana living requires more than 2 coats as well. I hope your move in is going smoothly!! For sure. Spring cleaning is totally a real thing. Good luck with the purge! These are just too dang pretty!! Totally crushing on this friend! Nope. Now it's all about the neutrals and Birkenstocks. No, really. I tried on some Birks on my last day in PDX at Imelda's and it was a disaster. So impressed that you even had the time to whip these up even amongst all the moving chaos. They sound like the perfect snack/dessert/dinner! Oh man, the capsule wardrobe. Tis but a dream to me. But it sounds like you're totally doing this move thing! Like, you're getting it done! And who cares if you just eat dessert instead of actual, savoury meals. I do that all the time and have no excuse. So, in conclusion please send five parfaits my way ASAP. 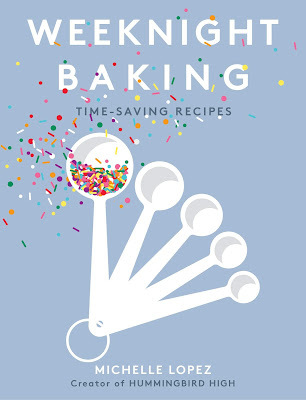 Hahah, I've always been a stress baker — I probably should have been packing instead of baking. Oh well! Thanks Thalia! Hope you're settling in to your new place as well! Hahah, I did NOT manage that box rule... nor that wardrobe capsule rule. Today I unpacked 7 different and nearly identical chambray shirts. why. my life. You have inspired me to clean out my closet! I think I may still have some bedazzled jeans in there! 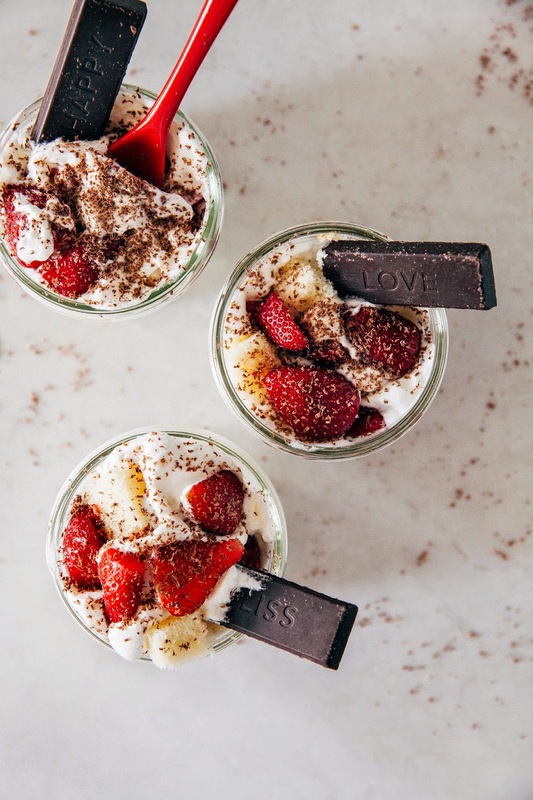 I am in love with these parfaits. SO gorgeous. This sounds so scrumptiously decadent but wholesome! Coconut is wholesome, right? ^_~ And organizing is literally my greatest weakness so it's safe to say my closet is....not a closet anymore. Yeah! I was impressed; I've had refined-sugar free chocolate before, but not like Aloha's. Thanks for commenting, Gabriella! And what a sweet comment too, I really appreciate it! Yep, coconut is most definitely wholesome. It's a superfood, right? These look beautiful and even if not healthy I am going to rationalize this as healthier than other dessert possibilities so there, justified! girl... I'm in Portland and I will HAPPILY take your Anthropolgie dresses. Find me at Pix. because Macarons. I am intrigued... I do trust your opinion so perhaps I'll give it a shot. Then I won't feel so guilty about eating lots of chocolate, right?! :) PS - I love that you used both Spanish and French in one catch phrase (Au contraire, mi amigo). You are the best. They're all at the Goodwill on SE 7th or the Hawthorne Buffalo Exchange now! No, really. The positive words on each bar was so cute. It's really what won me over. Hope your travels are going well!!! Let me know if you need Portland recs. Hey I love your food blog. Please check out mine and let's connect? We moved exactly a year ago, thank goodness we had everything packed and shipped because when I think my kitchen related stuff probably occupied a truck or two! Unpacking is no fun considering I just opened a few boxes last weekend (one year later). Back to your little parfaits, they are absolutely cute!!! These look amazing (as always). Packing and getting rid of things can be stressful and tiring but it's definitely cleansing. I've been working towards getting a Capsule Wardrobe but haven't quite gotten there yet! And side note, I totally love Anthropologie and their dresses! These are so pretty and I love the flavors here. My ex co-worker actually turned me onto Aloha back "before it was cool," but I didn't know they made chocolate. I need to try it. I love your description of the light kick of coconut at the end. It sounds marvelous. Oooh, this looks like a great summertime treat! Up next on my list is avocado, but afterward I want to try this one out! Is it sad that the first thing I thought when I read this post is that I wish you called me before you sold anything cause I'm pretty sure I would have bought most of it. I'm not moving for at least another year and feel like building up my closet again!! But alas, you probably saved me from myself. These little parfaits are the cutest and that coconut and almond snack cake sounds amaze.